Gave a talk today. For our Sacrament Meeting program they organized a state of the union-like theme for the Come, Follow Me Curriculum. There was a speaker for YW, YM, and Sunday School. It was amazing how we all had the exact same topic and approached it in completely different ways. Everybody kind of balanced each other out. First of all. 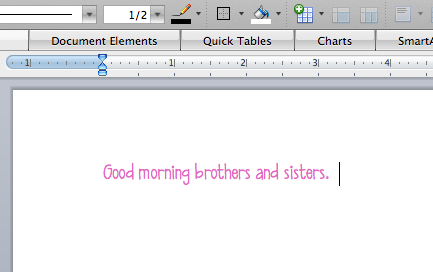 I HATE introductions. Can't do them. 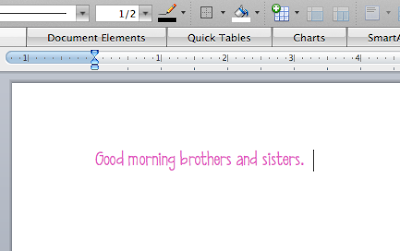 I think I've used the same introduction for every ward I've spoken in, and since this was my second talk in this ward, I was having major writer's block throughout the week. So, I didn't have one. I jumped right in. It made me laugh in my mind because it reminded me of the Snark and Testimony gifs. These are hilarious! But we'll save that for another time. I love change. This is coming from major experience. I'm pretty sure we've moved seven times in the last five years. Change is refreshing, it's exciting, and it helps you grow. You can learn from the past and take out all the good and add your own twist and traditions to turn it into something better. So, why is everything changing? Why now? 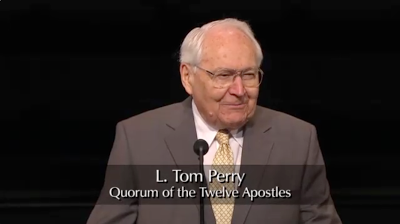 If anyone had a chance to watch the broadcast on Sunday for the Work of Salvation, L. TOM PERRY talked all about how the church is adapting to this generation. If you look at that from an eternal perspective, I wonder if maybe Heavenly Father's different generations of children need to learn and experience the gospel in different ways. Here's something to show how the times are definitely changing. 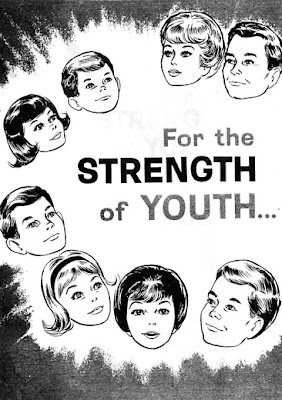 Just so you can see a difference in the generations, I wanted to quote a couple paragraphs from the For The Strength of Youth Pamphlet from 1965. First of all... what exactly are pedal pushers, knee-knockers, and bermudas? Pants for young women are not desirable attire for shopping, at school, in the library, in cafeterias, or restaurants. Any apparel that suggests a house robe should not be worn in public but only in one’s home or apartment. For the young men… When driving around in cars, working in the yard or elsewhere, they should wear appropriate trousers and shirts. Shorts may be worn during actual participation in active sports. “Grubbies” are inappropriate in public for everyone. A “real lady” does not go out in public, to the market, or to shops with her hair in curlers. 1. GOOD POSTURE - If one concentrates on good posture, most fad dances can be danced in a manner which will meet LDS standards. So, to me it definitely makes sense that as the times change, Heavenly Father may have a different way of raising different generations. Not only have these new lessons affected the youth, but it has helped my testimony to grow. Teachers are being pushed to grow spiritually. The most important part of your service will be your own daily spiritual preparation. Dedicate yourself to living the gospel with greater purpose than ever before. Learning outlines are not meant to prescribe what you will say and do as you teach. They are designed to help you learn the doctrine for yourself and prepare to engage the youth in powerful learning experiences. In every setting, He set the example. He taught others to pray by praying with them. He taught them to love and serve by the way He loved and served them. He taught them how to teach His gospel by the way He taught it. Overall, the path to conversion is a personal one. I kinda learned the hard way when I first started college that you can't exactly walk into a class, sit down, listen to the instructor, and then get up and leave and expect to get an A+ on your next exam. It takes a lot of time, energy, and commitment outside the classroom reading and studying if we want to truly learn. And these youth programs work the same way. Conversion does not happen in a meeting, class, or activity alone. Ultimately, youth are converted by diligently living the gospel each day-- praying, studying the scriptures, keeping the commandments, fulfilling priesthood and other duties, attending the temple, serving their families and others, and sharing the gospel. As they do these things, their desires, attitudes and actions being to align with Heavenly Father's will. "FOR NEARLY SIX THOUSAND YEARS, GOD HAS HELD YOU IN RESERVE TO MAKE YOUR APPEARANCE IN THE FINAL DAYS BEFORE THE SECOND COMING OF THE LORD. "WHILE THIS GENERATION WILL BE COMPARABLE IN WICKEDNESS TO THE DAYS OF NOAH, WHEN THE LORD CLEANED THE EARTH BY FLOOD, THERE IS A MAJOR DIFFERENCE THIS TIME: [IT IS THAT] GOD HAS SAVED FOR THE FINAL INNING SOME OF HIS STRONGEST... CHILDREN, WHO WILL HELP BEAR OFF THE KINGDOM TRIUMPHANTLY. "MAKE NO MISTAKE ABOUT IT -- YOU ARE A MARKED GENERATION." The youth are awesome! They are the final warriors pushing through these last days. PLANTS VS ZOMBIES-- they are the lawnmowers. I remember as a teen when adults would say, "I was a teenager once too and I know what you're going through..." And yeah, that's true, but at the same time, it's really not. I don't think we truly understand the spiritual battle that our youth have to face every single day. Satan is trying harder now than ever before and they are constantly being surrounded by temptation. The YW and YM are so strong and such an example to me. They teach me more than I could possibly teach them. I love my calling!